I am running several EC2 instances, and I want to know the exact work my CPU is doing. 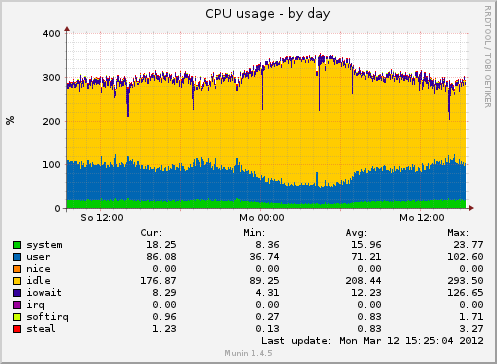 On "normal" machines I am doing this with munin and its CPU plugin which looks at the statistics provided by /proc/stat. I know that I should use Amazon CloudWatch to see the total CPU usage (and this is the official and recommended from Amazon way to do this), but I am specifically looking on how the CPU usage is spend (e.g. system, user, iowait). Is there a way to get detailed CPU usage statistics on EC2 instances? Your graphs are being thrown off by how the underlying virtualization shares CPU power between VMs. If you ignore the steal and idle values the numbers should line up closer to reality. Not the answer you're looking for? Browse other questions tagged amazon-ec2 central-processing-unit cpu-usage munin or ask your own question. What should I look for when monitoring an Amazon EC2 Micro Instance's CPU usage? How to get Amazon ELB to handle large traffic ramps? Amazon EC2 - Do two large instances running in parallel perform (more or less) the same as an extra large instance? How should I monitor memory usage/performance in SunOS/Solaris?